Let's face it, sometimes we (or at the very least I) forget how elegant and eloquent simplicity can be. With the weather cooling back down for a little bit, I decided it was time to relax and bring it back to basics. Never underestimate the power of a great pair of jeans and stylized accessories. 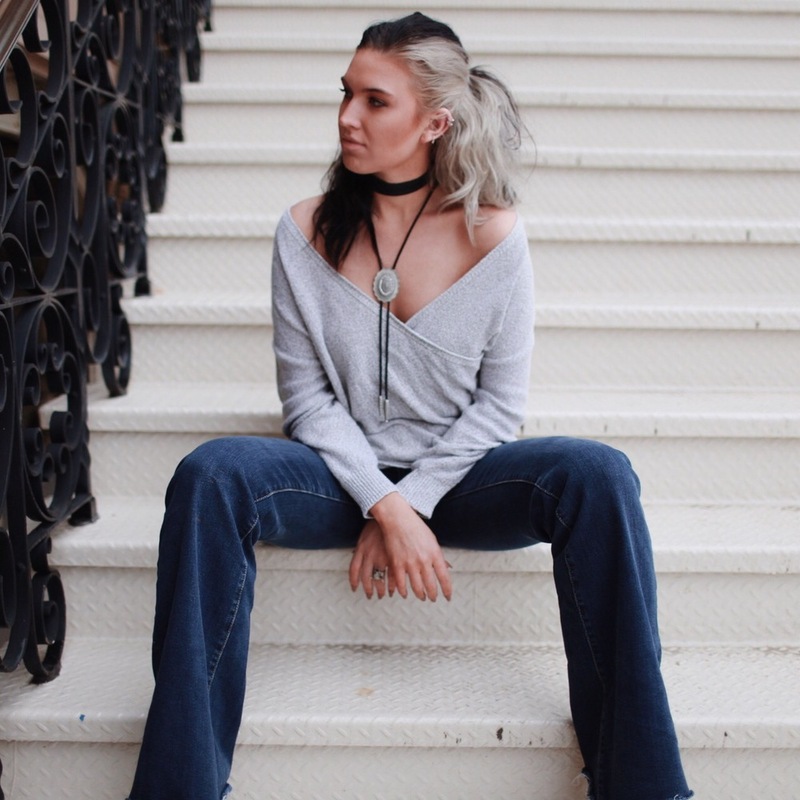 Elevating a flared jean and off the shoulder sweater combo is simple with pieces like chokers, bolo ties, and statement rings. I decided to take my western accessories up a notch by adding a western styled pointed toe boot, but any heeled boot would work. 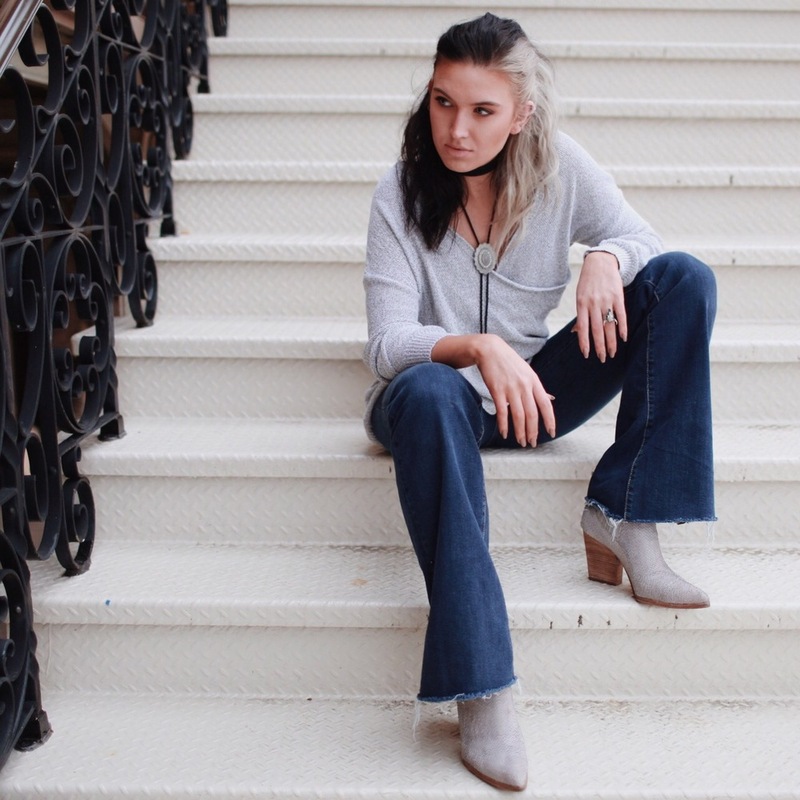 To keep my color palette light, I stuck to a light grey sweater and boot combo. Greys and denims compliment each other insanely well...so well that I've been calling grey booties a 'must have' denim companion. So in short, today's lesson is this: it's so easy to fall into trend traps and forget the basics. If it looks good, wear it! You can never go wrong with a flattering pair of jeans and you CERTAINLY can never go wrong with a top that accentuates your neck and collarbone (like this off the shoulder, deep v sweater). Invest in a few good pieces of jewellery and I promise you'll see how easy it can be to spice up your basics!